The weather was recently quite cold and grotty, with an earnest flurry of snow a couple of weeks ago. 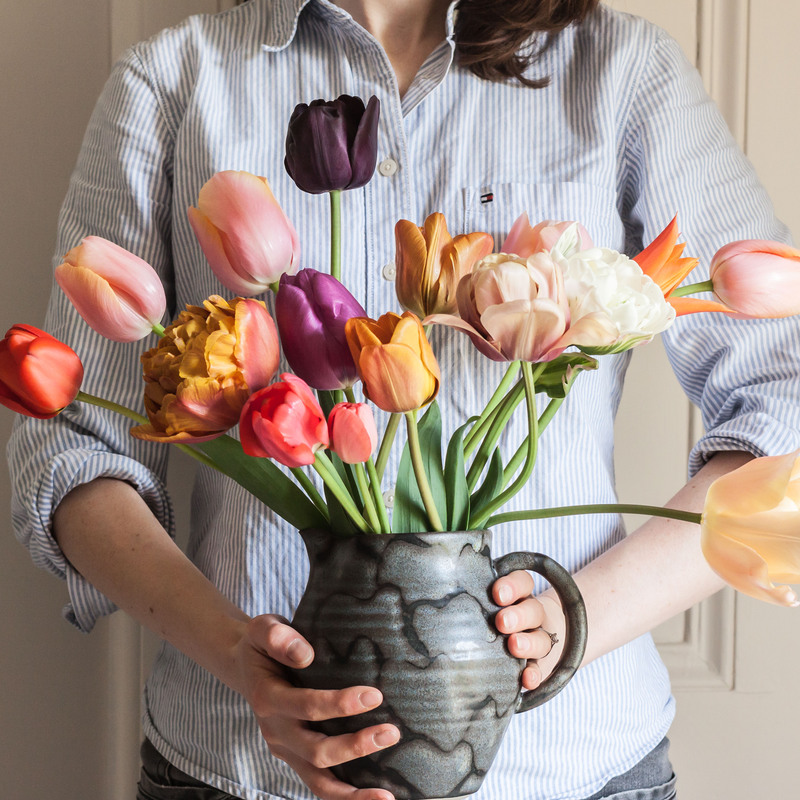 It has still been too dark/cold to do anything in the garden on weekday evenings, so most gardening activity is currently confined to my imagination. I have been imagining growing potatoes. Potatoes can be grown in a pot or in the ground. My grandmother grows potatoes every year, some in a large tub and others in a big bed, where they spread about and get lost, and it’s the devil to find them all again. I think it is interesting that potatoes are the only starchy carbohydrate one can reasonably grow in a garden. Think of all the staples: potatoes, bread, rice and pasta. Think even of couscous, polenta and barley. All come from grain, except potatoes. Clearly as a gardener you are unlikely to be growing wheat, oats or barley unless you own a field and a scythe. Rice requires paddy fields, which again the average gardener does not often have, except people currently living in South England. But potatoes? Anyone with outdoor space can grow potatoes. Before we had pasta and rice, Britain lived off potatoes (except Scotland, which lived off Scott’s Porridge Oats). When the potatoes failed, people died. And before the 1500s when Sir Walter Raleigh pedalled back to England with his new-fangled potatoes, we had… bread. Just bread. Probably not very nice bread. Somehow the idea of growing such a vital energy supply in the back garden feels reassuring, as though I were better equipping us to survive an apocalypse. I am entranced by this. I later find out it’s too good to be true. If it were really like this, everyone would be growing their own damned potatoes and all potato farmers would cease to exist. For a start, you’re not supposed to use spuds from the greengrocer as you risk introducing potato diseases to your garden. (We should also avoid putting potato peel onto our compost heaps for the same reason. Who knew this? I’m sure our communal compost heap is riddled with potato peel!) Secondly it takes at least three months, not four weeks, for the potato crop to mature. The tub needs to be in a warm, sunny place. Bad luck for mine, then! I wonder if planting them slightly later than recommended (which is end of Feb for new potatoes) might be wise. Potatoes do not like frost. Does this mean I will have to wait before getting cracking? 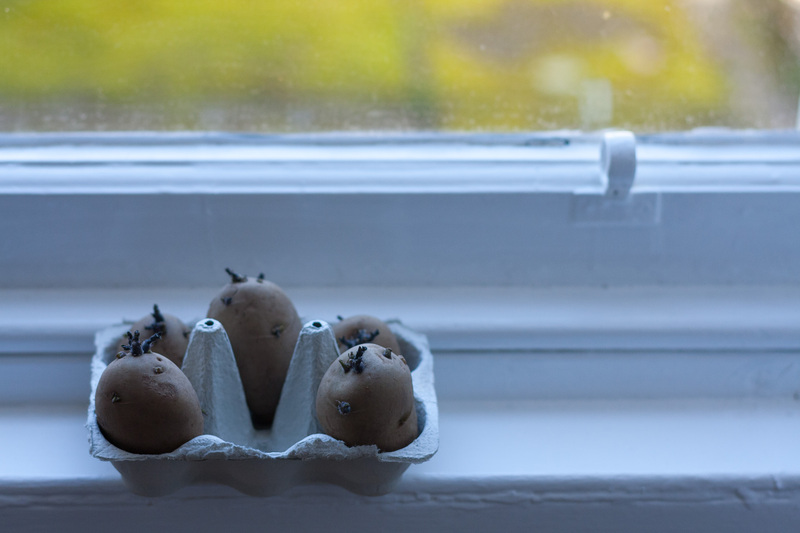 No, thankfully (I’m not great at waiting), because for four weeks before planting them outside you are supposed to ‘chit’ the potatoes, which means putting them in a cool, light place, say on a windowsill, until they have strong green shoots. This will help get them off to a better start when you plant them, and give me something gardeny to do while it’s too cold to garden. Here are my potatoes quietly chitting away to themselves. Next Post Where are all my birds?